← ኢትዮጵያ በ21ኛው ክፍለ ዘመን !? 1) የሁላችንም የሆነችው ኢ ት ዮ ጵ ያ ሃገራችን ወደ አዲሱ የ ሰላምና የብልጽግና መንደር ና ዘመን ለመሸጋገር በምታደርገው ጉዞ ላይ ከረጅም ጊዜ ጀምሮ የተዘረጋላት ድልድይ ያለ ይመስለኛል:: በእግዜር ይሁን በተፈጥሮ ለባለ ጉዳይ እንተወው:: በዚህ ድልድይ፦ ዕጣ ክፍሏ ሆኖ፦ ዛሬ በሆነ ባልሆነው በማይሆን እየዘለለ፤ ድልድዪን መከራ የማያበላ የፖለቲካ ወገን ያለ አይመስልም። ………. ስለሆነም፡ እንዳው ኣረፍ ብሎ ለሁላችንም ለማሰላሰል ይበጅ ይሆናል በማለት፡ በኣርቆ ኣሳቢነቱ በሁሉም ሰው ዘንድ የተወደደውን የታዋቂዊውን የኣውሮፓ ያለፈው ክፍለ ዘመን ባለ ቅኔ፦ ፍራንስ ካፍካ፦ ኣጭር መልክት ወደ ኣማርኛ ለቀቅ ባለ መልኩ ለመተርጎም ሞክሬያለሁ። „The Bridge“ – „Die Brücke“ ድልድይ፦ ይባላል (ከፍራንስ ካፍካ, 1916). 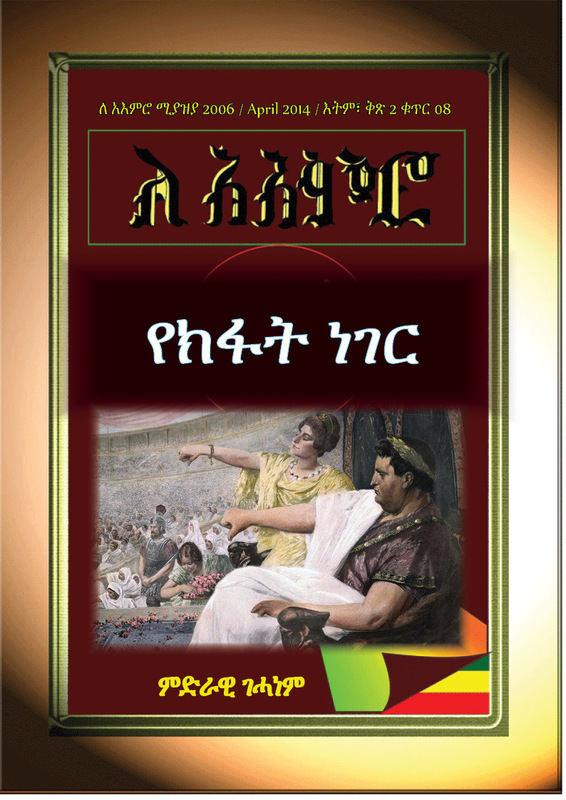 ድልድይ እንደ መሬት ታግሶ እንደ ሰማይ ረቆ ሁሉንም ሊያስታናግድ ሲገባው፦ ቀና ብሎ አስቸጋሪ እንግዳውን ለይቶ ለማስቀረት ከተመለከተ፤ እንግዳው መንገደኛ ደግሞ ድልድዩን እንዳይኑ ብሌን ጠብቆ በንክብካቤ ከልተገለገለበት፤ ለሁሉም አይበጅም፤ መጥፊያቸው ነው ማለት ነው !!! የኢትዮጵያ ድልድያችን ዕጣም ይህ እንዳይሆን ሁሉም ማስተዋል ኣለበት! I was stiff and cold, I was a bridge, I lay over a ravine. My toes on one side, my fingers clutching the other, I had clamped myself fast into the crumbling clay. The tails of my coat fluttered at my sides. Far below brawled the icy trout stream. No tourist strayed to this impassable height, the bridge was not yet traced on any map. So I lay and waited; I could only wait. Without falling, no bridge, once spanned, can cease to be a bridge.It was toward evening one day- was it the first, was it the thousandth? I cannot tell- my thoughts were always in confusion and perpetually moving in a circle. It was toward evening in summer, the roar of the stream had grown deeper, when I heard the sound of a human step! To me, to me. Straighten yourself, bridge, make ready, railless beams, to hold up the passenger entrusted to you. If his steps are uncertain, steady them unobtrusively, but if he stumbles show what you are made of and like a mountain god hurl him across to land. knowing what was happening. Who was it? A child? A dream? A wayfarer? A suicide? A tempter? A destroyer? And I turned so as to see him. A bridge to turn around! I had not yet turned quiet around when I already began to fall, I fell and in a moment I was torn and transpierced by the sharp rocks which had always gazed up at me so peacefully from the rushing water. Ich war steif und kalt, ich war eine Brücke, über einem Abgrund lag ich. Diesseits waren die Fußspitzen, jenseits die Hände eingebohrt, in bröckelndem Lehm habe ich mich festgebissen. Die Schöße meines Rockes wehten zu meinen Seiten. In der Tiefe lärmte der eisige Forellenbach. Kein Tourist verirrte sich zu dieser unwegsamen Höhe, die Brücke war in den Karten noch nicht eingezeichnet. – So lag ich und wartete; ich mußte warten. Ohne einzustürzen kann keine einmal errichtete Brücke aufhören, Brücke zu sein. Einmal gegen Abend war es – war es der erste, war es der tausendste, ich weiß nicht, – meine Gedanken gingen immer in einem Wirrwarr und immer in der Runde. Gegen Abend im Sommer, dunkler rauschte der Bach, da hörte ich einen Mannesschritt! Zu mir, zu mir. – Strecke dich, Brücke, setze dich in Stand, geländerloser Balken, halte den dir Anvertrauten. Die Unsicherheit seines Schrittes gleiche unmerklich aus, schwankt er aber, dann gib dich zu erkennen und wie ein Berggott schleudere ihn ins Land. This entry was posted in ሌሎች / others, ባህላዊና ማህበራዊ /Cultural & social, ነፃ አስተያየት/Free Opinions, ኪነ፥ጥበብ. Bookmark the permalink.